Synopsis: Come of age in Vampire Mountain ... or perish; The trials: seventeen ways to die unless the luck of he vampires is with you. 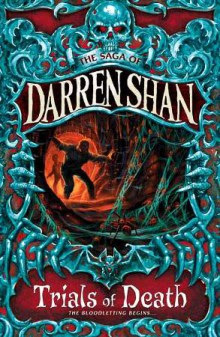 Darren Shan must pass five fearsome trials to prove himself to the vampire clan - or face the stakes in the hall of death. But Vampire Mountain holds hidden threats. Sinister, potent forces are gathering in the darkness. In this nightmare world of bloodshed and betrayal, death may be a blessing. Review: This is the fifth book in the Cirque Du Freak series. I bought all twelve of the books in the Cirque Du Freak series at a local second hand shop. These books cost 99p and come on a buy one get one free offer. This book was an excellent read and I found myself lost in this book for hours at a time. I could not bring myself to put this book down and stop reading. So far I am really enjoying this series and I am extremely excited to get through the rest of the books. I am curious to see if the book set comes to a satisfying end or whether they leave me wanting to know more. I would highly recommend this book boxset to anyone with an interest in Young Adult and Paranormal stories. In the near future I plan to invest in a brand new copy of these books and will be donating the old set back to a charity shop so that someone else gets to experience the wonders of Darren Shan. These books will always have a place on my bookshelves.